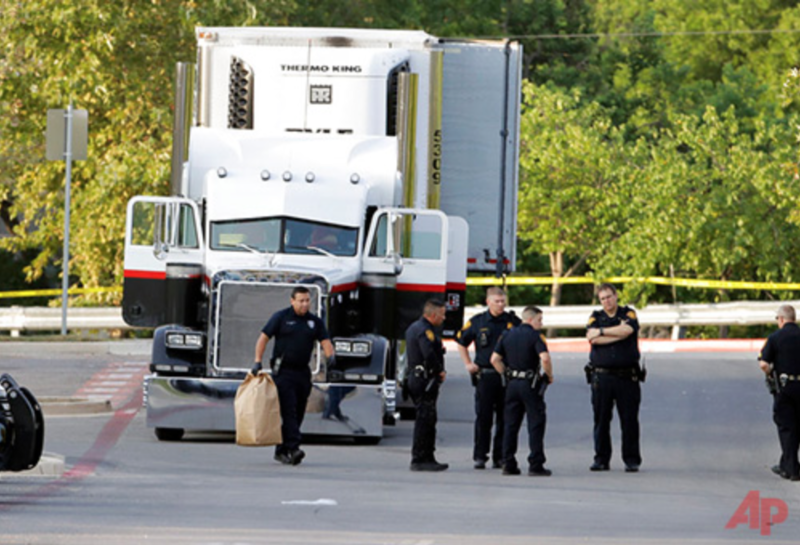 SAN ANTONIO (AP) — Nine people are dead and the death toll could rise after emergency crews pulled dozens of people from a sweltering tractor-trailer found parked outside a Walmart in the midsummer Texas heat, victims of what officials said was an immigrant-smuggling attempt gone wrong. The driver was arrested, and nearly 20 others taken from the rig were hospitalized in dire condition, many with extreme dehydration and heatstroke, officials said Sunday. One U.S. official said Sunday evening that 17 of those rescued were being treated for injuries that were considered life-threatening. The official spoke to The Associated Press on condition of anonymity because the information has not been publicly released. Authorities were called to the San Antonio parking lot late Saturday or early Sunday and found eight people dead inside the truck. A ninth victim died at the hospital, said Liz Johnson, spokeswoman for U.S. Immigration and Customs Enforcement. The victims “were very hot to the touch. So these people were in this trailer without any signs of any type of water,” San Antonio Fire Chief Charles Hood said. Based on initial interviews with survivors of the San Antonio tragedy, more than 100 people may have been packed into the back of the 18-wheeler at one point in its journey, ICE acting Director Thomas Homan said. Officials said 39 people were inside when rescuers arrived, and the rest were believed to have escaped or hitched rides to their next destination. Four of the survivors appeared to be between 10 and 17 years old, Homan said. Investigators gave no details on where the rig began its journey or where it was headed. “Even though they have the driver in custody, I can guarantee you there’s going to be many more people we’re looking for to prosecute,” Homan said. Mexican Consul General in San Antonio Reyna Torres said Mexican nationals were among the survivors and those who died on the rig. A Guatemalan official said two natives of Central American country were among those hospitalized. Consul Cristy Andrino in McAllen said the two told her they had crossed into the U.S. on foot and were later picked up by the rig. Guatemala was seeking to obtain witness status for the two survivors so they wouldn’t be deported, Andrino said. Federal prosecutors said James Mathew Bradley Jr., 60, of Clearwater, Florida, was taken into custody and would be charged on Monday in federal court. The local U.S. Attorney’s Office wouldn’t say whether Bradley was the alleged driver of the truck who was arrested. It was not immediately known whether Bradley had an attorney who could speak on his behalf. San Antonio is about a 150-mile (240-kilometer) drive from the Mexican border. The temperature in San Antonio reached 101 degrees (38 Celsius) on Saturday and didn’t dip below 90 degrees (32 C) until after 10 p.m. The tragedy came to light after a person from the truck approached a Walmart employee and asked for water late Saturday night or early Sunday morning, said McManus, the local police chief. The employee gave the person water and then called police, who found the dead and the desperate inside the rig. Some of those in the truck ran into the woods, McManus said. Investigators checked store surveillance video, which showed vehicles arriving and picking up people from the truck, authorities said. Walmart released a brief statement Sunday saying it was doing what it could to help investigators. On Sunday evening, about 100 people gathered at a San Antonio church for a vigil to mourn those killed. Those gathered held a moment of silence, then gave speeches blaming federal and Texas authorities’ embrace of harsher immigration policies for contributing to the deaths. Jonathan Ryan, executive director of a nonprofit called Raices, said it’s “an unfortunate example” of what happens when such policies are enacted. A new law approved by the Texas Legislature lets police inquire about peoples’ immigration status during routine interactions such as traffic stops. Bob Libal is executive director of Grassroots Leadership, an Austin-based nonprofit that supports more liberal immigration policies. A group of immigration lawyers and advocates sued Homeland Security Secretary Kelly and other U.S. officials this month alleging that guards on the U.S. border with Mexico have illegally turned away asylum-seekers. “These criminal organizations, they’re all about making money. They have no regard for human life,” Homan said.